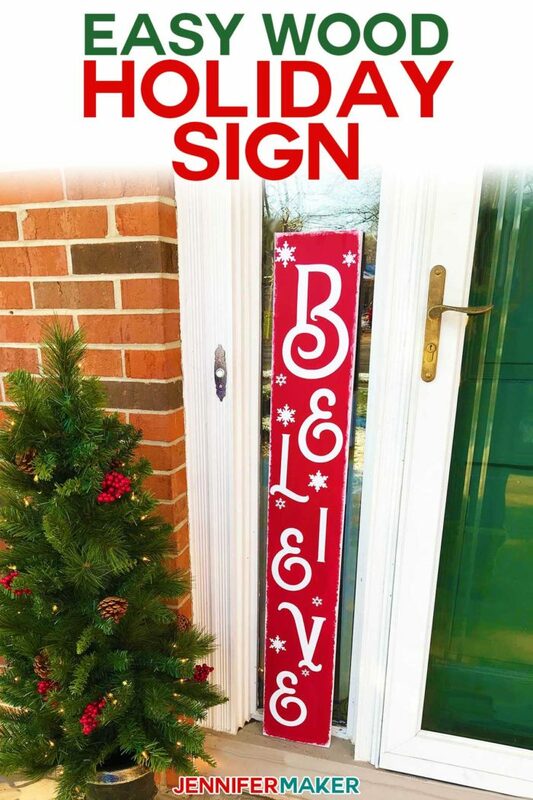 Easy Vertical Welcome Sign – Reversible for the Holidays! 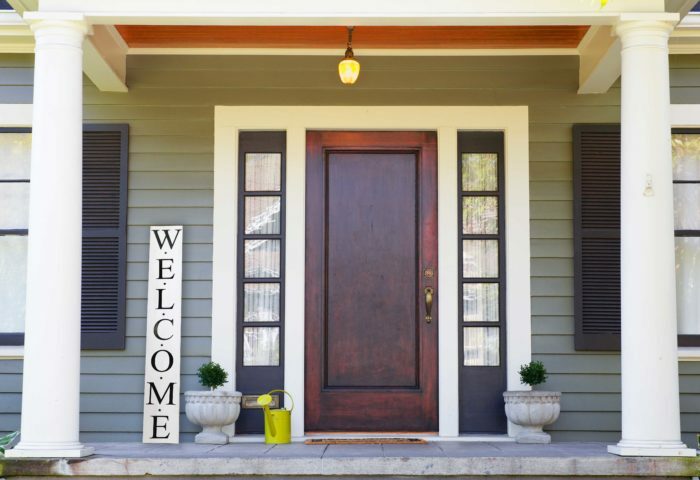 Make an eye-catching vertical welcome sign for your front porch with this easy tutorial! Let’s spruce up our front porches today! 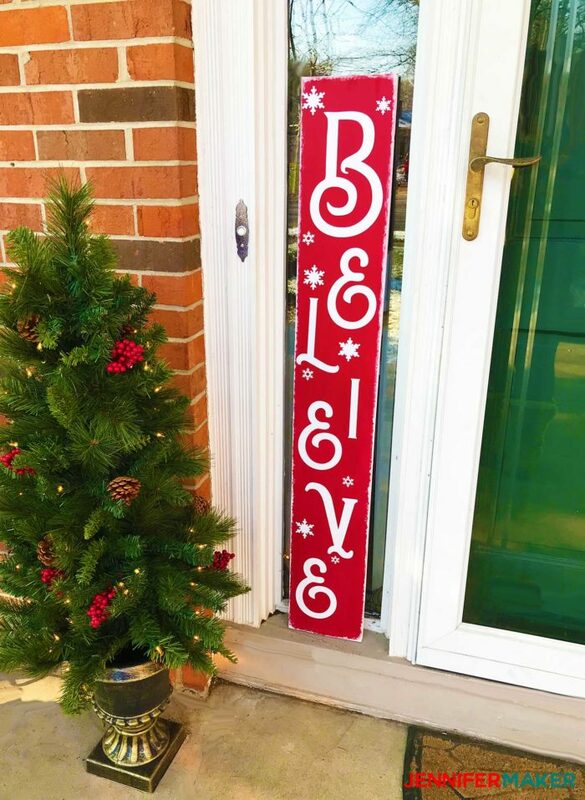 For Day 1 of The Great Maker Show and Tell Challenge, we are making a pretty, double-sided vertical welcome sign for your front porch with the words “Welcome” on one side and “Believe” on the other. I picked this project for the first day of the Challenge because it’s a simple project with big impact! And it’s the perfect welcome to our challenge, don’t you think? Huge thanks to many readers who requested this project (Kat, Mandy, Maira, Rosanne, Kim, Lyn, Sarah, Christine, and Kathy). This vertical welcome sign was the #1 requested project received to date! Each person who contributed this project idea will receive an extra entry for your suggestion (I am keeping track on this on my end). Remember, you can suggest project ideas for this Challenge here and receive entries to win one of our fabulous prizes, including a Cricut Maker! This vertical welcome sign is permanent vinyl on wood. 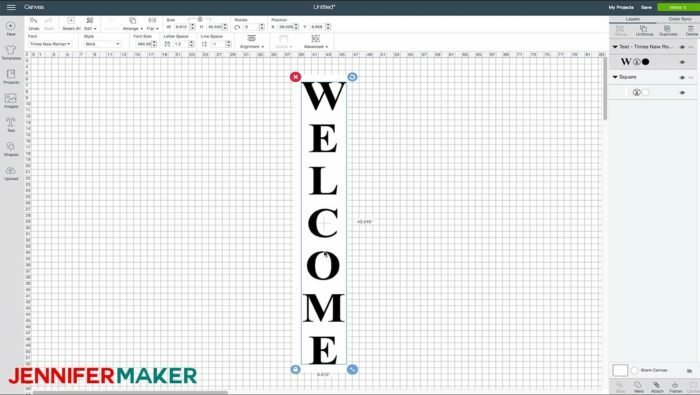 For the Welcome sign, I show you how to make the vertical letters in Design Space and how to cut them out on a regular-size 12″ x 12″ mat so you can line them up perfectly. And for the Believe sign, I’ve created an SVG that all you have to do is upload and cut. 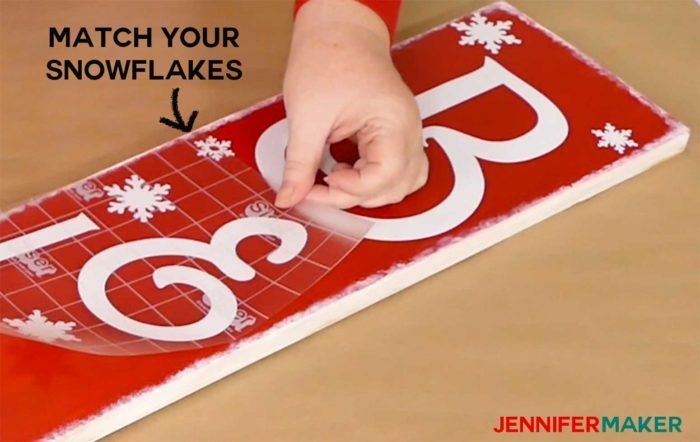 I even show you how to paint the board so your vinyl letters adhere best — one side looks a little weathered, the other side looks a little snowy. Here’s the holiday side of my vertical welcome sign on my front porch! 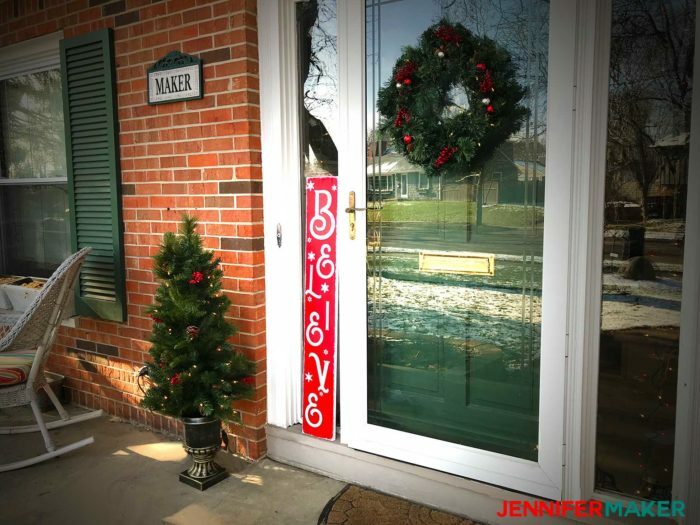 I’ve been getting a lot of questions about what font I used for the “Believe” sign. It’s actually a combination of two fonts — Roland Emerald Regular and Black Django Regular — plus I customized the letters a bit. Both are available from FontBundles.net. 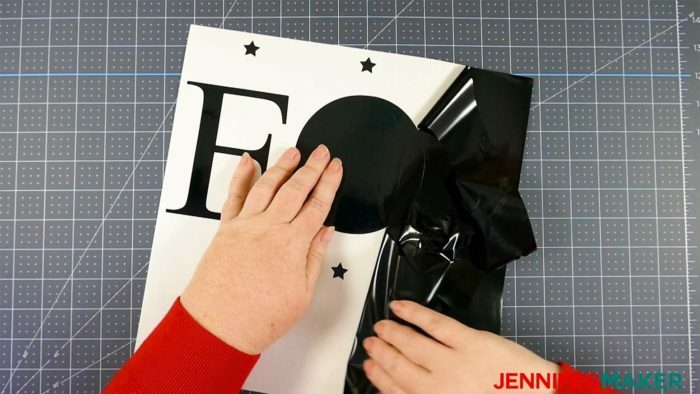 Key concepts taught in this tutorial include how to create vertical letters in Cricut Design Space, how to create registration marks, how to create larger-than-mat projects, how to weed vinyl (simple designs), and how to transfer vinyl to material. 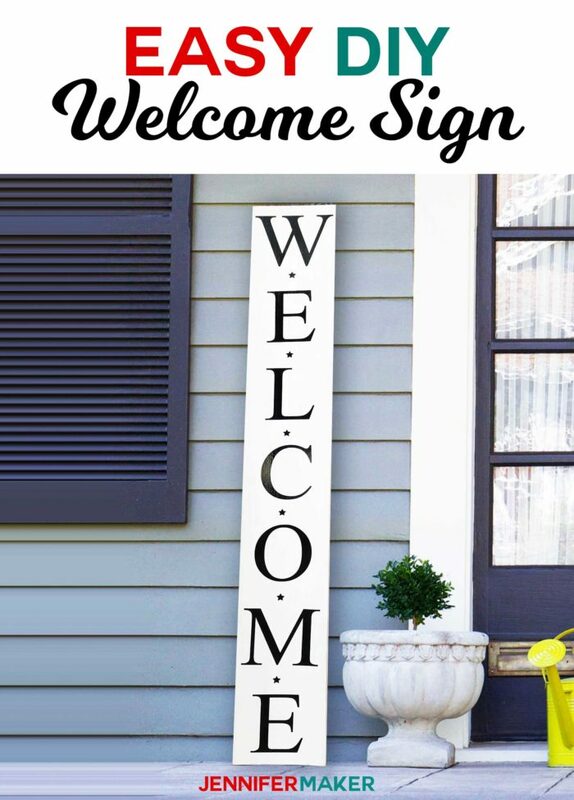 I’m so excited to show you exactly how to make this fun vertical welcome sign! This post contains some affiliate links for your convenience (which means if you make a purchase after clicking a link I will earn a small commission but it won’t cost you a penny more)! Read my full disclosure policy. First, you need to prepare your board. 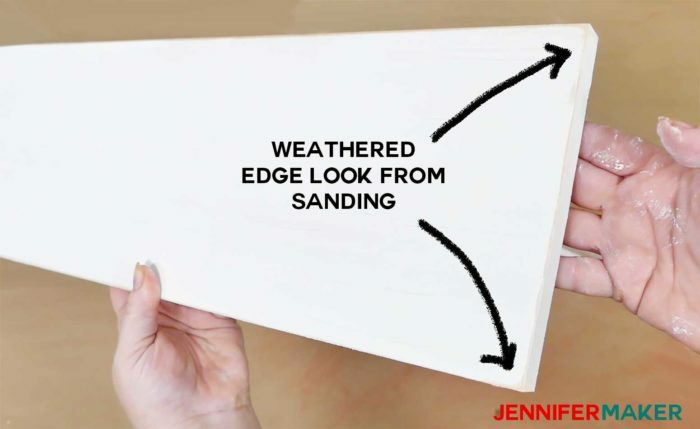 Begin by sanding both sides of your sign board. Now paint both sides. I painted one side in whisper white texture chalk paint and the other side in imperial red chalk paint. 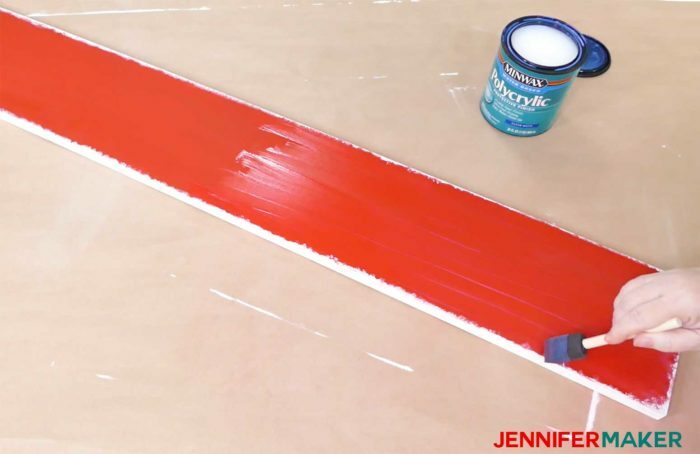 I used chalk paint because I like the texture and the way you can sand it off to create a weathered look, but you could just use regular acrylic or latex paints. 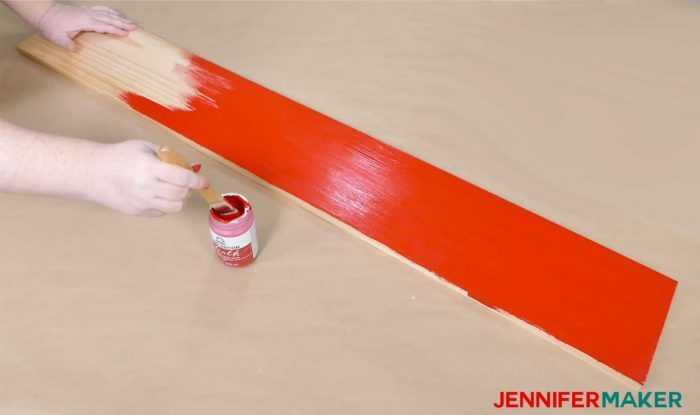 Tip: If you want a weathered look, sand the edges and/or flat surfaces of your board after about one hour, when the paint isn’t quite dry yet. 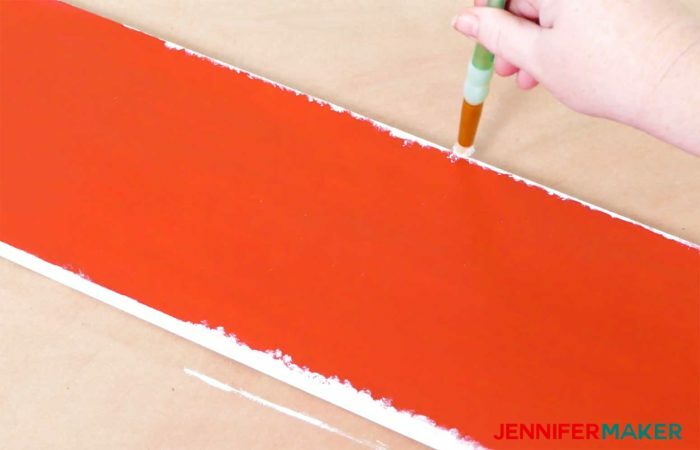 Optionally, you can use a dry brush with white paint to create a snowy look around the edges of your board. Just dab the dry brush with a little paint onto the edges in random patterns. Once the paint is dry (at least 24 hours), sand the surfaces again. You want them super smooth for your vinyl to stick well! Wipe off all the sanding dust when you’re finished. Note: If you bought a pre-painted board, you may not need to prep it at all. If the surface seems at all rough, however, use the Polycrylic finish on it — it’ll make a huge difference and save you lots of headaches. With the square selected, click the small lock icon at the top of the screen and enter your board’s width and height. Type your word, one letter at a time, with a return in between each one to move it to the next line. I typed “WELCOME” for my vertical welcome sign. With the text select, click Fonts and choose a clear, readable font. I chose Times New Roman. I also recommend all caps for legibility. With the text still selected, click Alignment and choose Center . All of your letters will now be centered vertically. Click and drag the text over to the rectangle and resize it so it fills most of the space (you need some white space around the outside, so don’t go edge to edge). You can resize by clicking and dragging the double-arrow icon in the lower right corner of the text box. To lengthen or elongate the letters, click the arrows in Line Space until you are pleased with how it looks. 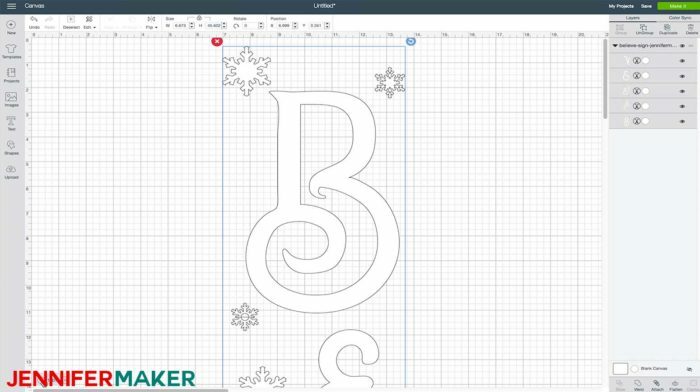 Now go to Advanced and click Ungroup to Letters — this separates each letter onto it’s own layer in Cricut Design Space. 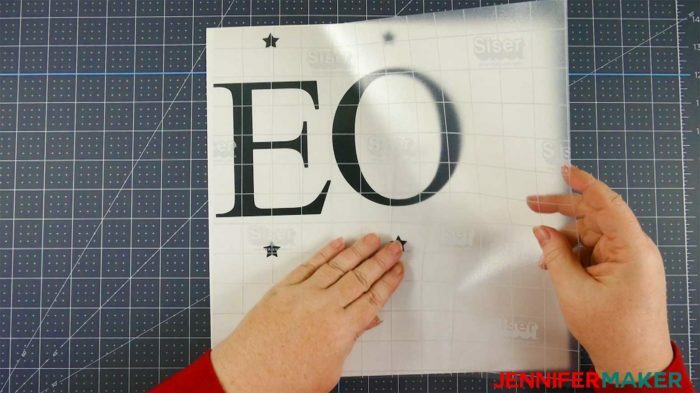 You could stop here and cut out your vinyl, but you’d have to manually place each letter on your board and hope you centered and aligned them correctly. But there’s no need to guess — there’s a better way. Keep reading for my trick on how to perfectly align your vertical letters. In your Welcome sign design, click Shapes and select Star. Change the color of the star to match the color of your letters (in my case, to black). Drag the star over under the first letter and resize it smaller (you can decide what size you want to make it). 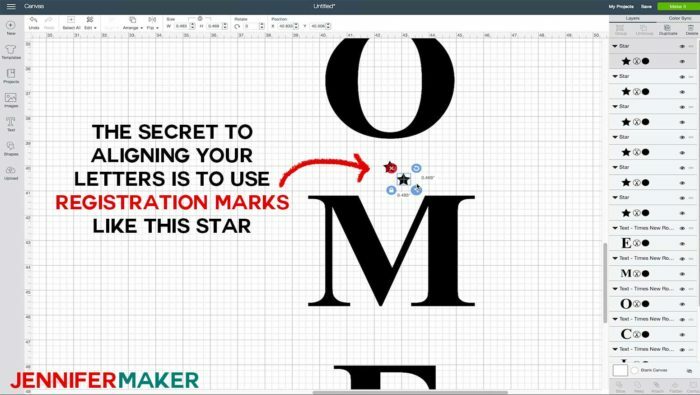 Right-click the star and make duplicate copies, then click and drag them in between each letter of your design. Click Select All, then click Align and select Center Horizontally. Now make several more stars the same size and color, but drag them off to the side to use later. Select the first letter and the first star directly below it, and click Attach. Drag one of the stars on the side over on top of the first star, then select that star, the second letter, and the second star, and click attach. Repeat this process with the rest of your letters. Your goal is to attach the letter to the stars above and below it (the first and last letter don’t have stars above and below, unless you add them). Click Make It and cut our your sets of letters and stars. 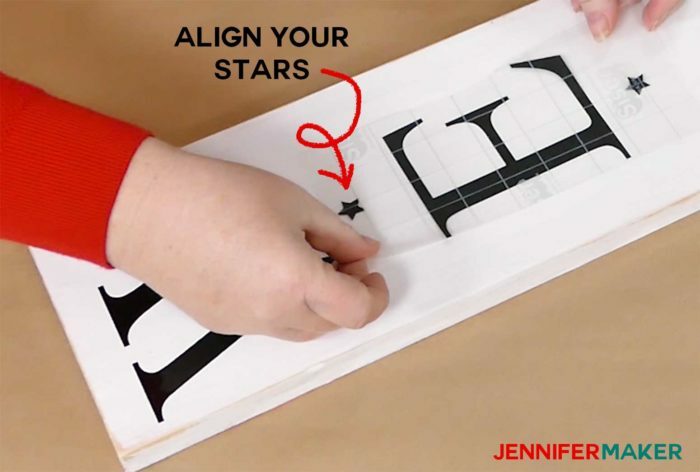 Now you can align your letters with one another simply by aligning the stars on the cut pieces! Tip: You can use any shape to make a registration mark — it doesn’t have to be a star. A star just works really well because it has all of those pointy bits to help you line it up with. And you don’t have to keep it in your final design either — use it for alignment, but don’t transfer it to your project. Note: Your letter and registration mark attachment cannot exceed the size of your material/mat. So nothing bigger than 11.5″ high (for a 12″ x 12″ mat) and nothing bigger than 23″ and 11.5″ wide for a 24″ mat. The “Believe” SVG cut file is available in my resource library, if you want to use that! No preparation is necessary for that design — just upload and go! 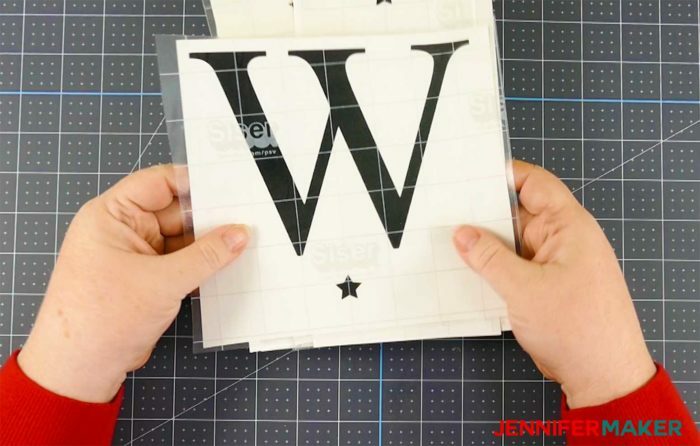 With your vinyl letters all cut, gently remove the excess vinyl from the backing. You may want to use a weeding tool, though I didn’t need to for this simple design. Your vinyl is cut, but now you need to get it onto your board. 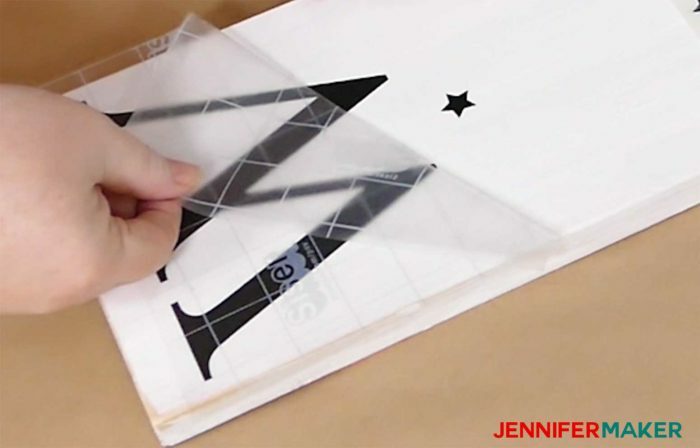 To do this, first apply transfer tape or a transfer sheet over the designs. Press and burnish the vinyl to the transfer sheet well! 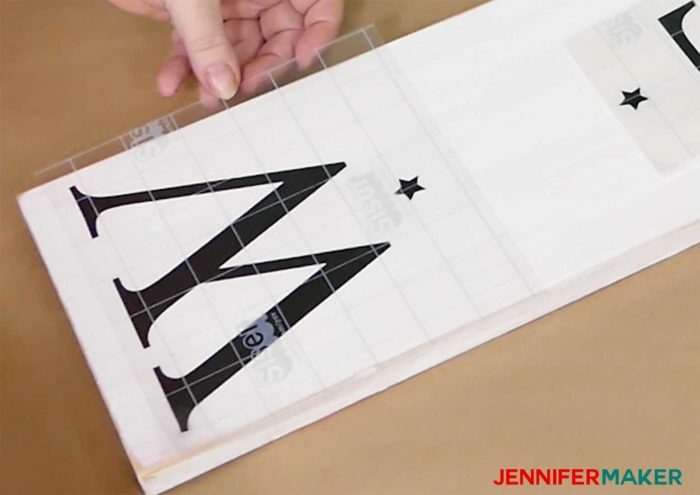 Separate each letter from the others by cutting it with scissors, being mindful to keep the stars with the letters. Put your letters in the order they belong so you don’t accidentally apply them in the wrong order. 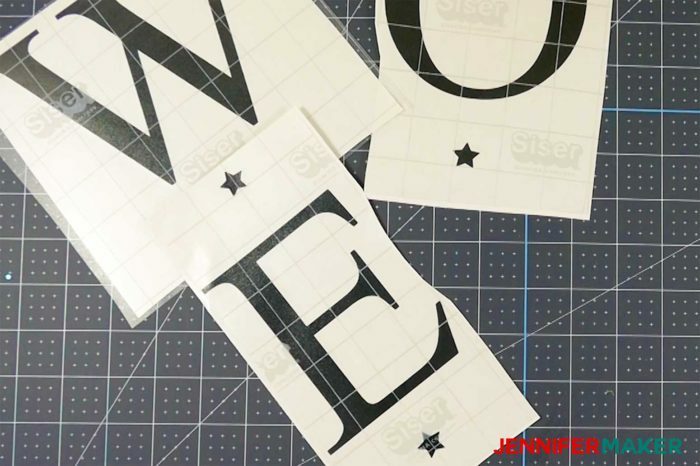 Peel the backing off the first letter and place it on your wood sign board about 1″ down from the top, centered. Press the vinyl down well and gently remove the transfer tape from the vinyl. Now peel the backing off the second letter and align its top star to the bottom star of the letter above. Continue doing this until you have all of the letters in place. And that’s it! There’s no need to finish the surface of the vertical welcome sign since you already have polycrylic on and you’re using outdoor vinyl, but you can if you really wish. I put my sign on my front porch already. Doesn’t it look great? If you make one of these awesome vertical wood signs, please share a photo in our Facebook group, email it to me at [email protected], or tag me on social media with #makershowandtell. See all of the projects, tutorials and free designs in The Great Maker Show and Tell Challenge! Want to remember this? 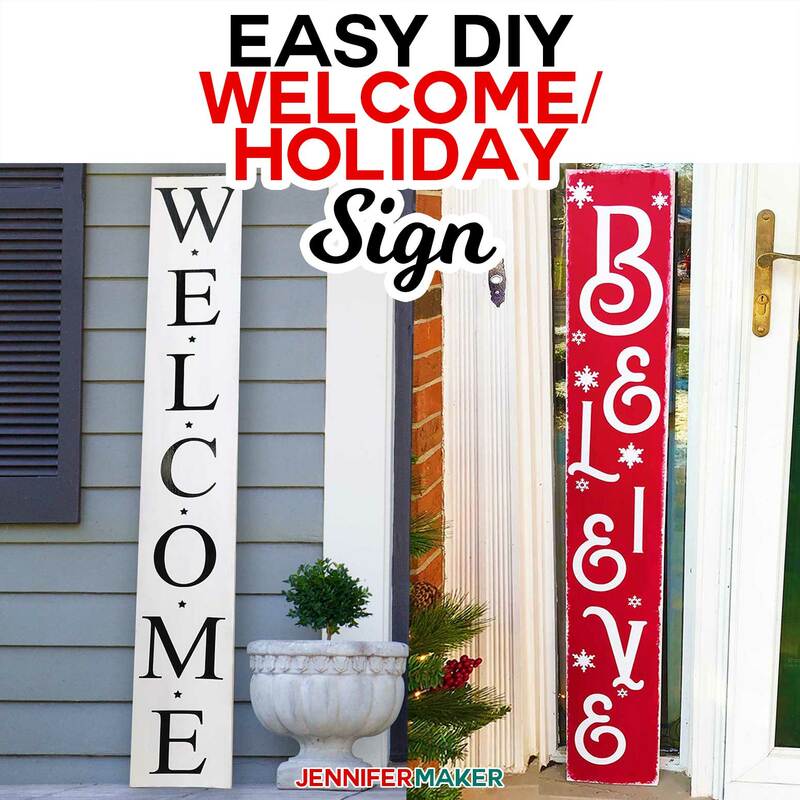 Save the Easy Vertical Welcome Sign to Your Favorite DIY Pinterest Board! Previous Post: « The Great Maker Show & Tell Challenge: Win a Cricut Maker & More! Beautiful project! Love the red! Glad you like it, Denise!